Amyloidosis describes a group of rare diseases caused by abnormal fibrillar protein aggregation within the interstitium of tissues and organs throughout the body. This chapter focuses upon the pathogenesis, epidemiology, diagnosis and management of these heterogeneous disorders. 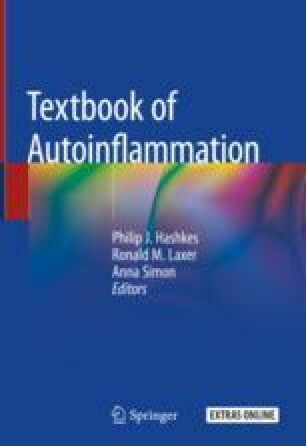 AA amyloidosis is one of the most feared complications of autoinflammatory syndromes but it is becoming increasingly rare with the advent of effective anti-inflammatory therapy. The most common of the systemic amyloidoses are immunoglobulin light chain (AL) type and wildtype transthyretin (wtATTR) amyloidosis, the latter a probably much underdiagnosed cause of heart failure in the elderly. Precise diagnosis, confirmation of amyloid type, evaluation of amyloidotic organ involvement and associated underlying disorders are imperative for optimal patient care. Although histology has long been the diagnostic gold standard, new technologies including mass spectrometry of tiny tissue samples and highly specific imaging comprising; I123 labelled serum amyloid P (SAP) component scintigraphy, 99mTc-labeled 3,3-diphosphono-1,2-propanodicarboxylic acid (99mTc-DPD) scintigraphy and cardiac MRI (CMR), have lately transformed the evaluation of patients. A multidisciplinary approach to management is key. Treatment comprises support of failing amyloidotic organs, measures to reduce production of the respective amyloid fibril protein such as suppression of serum amyloid A (SAA) in systemic AA amyloidosis, and recently, novel therapies aimed at enhancing clearing of existing amyloid deposits.